With a little planning and intention, maintaining (or even starting) healthy habits during the new year can be fun and easy. This January, we invite you to join us for a series of monthly Wellness Challenge – a month-long series of guided wellness practices to help you move more, eat better, sleep soundly, and feel great. The first month long Lemon Grove School District Staff Wellness Challenge will kick off on January 10th, and conclude on Friday, February 1st. Each month we'll reveal a set of five wellness challenges to attempt during the month. The monthly challenge set will be posted on the district website on the Employee Wellness Webpage and communicated to all staff via e-mail. Each challenge in the monthly set will be worth between 1 and 10 points. Complete the challenges to collect the points! Overall Winners - combined point totals for participating in all the monthly challenges. This post is part of our first monthly Lemon Grove School District Staff Wellness Challenge, highlighting healthy ways to celebrate and enjoy the new year at home, school and work. Welcome to Month 1 of the Lemon Grove School District Staff Wellness Challenge! We’re excited you’re here! This month - January 14th to February 8th, is all about increasing your physical activity and movement. We know that exercising is one of the most important things we can do for our health. Research shows that engaging in regular physical activity can strengthen our bones and muscles, reduce our risk of disease, and improve our mental health and mood. Not to mention, exercising can be a whole lot of fun, too! This month’s challenges are designed to remind you that with a little creativity and intention, physical activity can happen anytime and anywhere. Remember, the rules are simple: complete as many challenges as you can before the end of the month and collect the corresponding number of points for each completed challenge. At the end of the month, tally up your points to collect your secret prize! Every staff member who participates will receive a prize that supports your wellness journey. In addition, every staff member who completes all of the challenges, plus the bonus challenges will receive an additional reward! Every bit of movement matters. This month, find a new way to add an extra minute of physical activity to your day. Get creative: take the stairs instead of the elevator, do 10 walking lunges en route to your next destination, park in the parking spot farthest from where you enter the school everyday, or try a Fitness Break. Swap the car or bus one day this month for a more active form of transportation, like walking or biking. The fresh air and extra movement will help you feel alert and energized to begin your day! Follow these steps from the National Center for Safe Routes to School to find the safest route to your destination. If walking or biking isn’t feasible, consider parking further from your destination or taking a slightly longer route on public transportation to add in a few extra steps! Regular stretching can improve your circulation and help prevent injury. Set aside 10 minutes each day to give your body a good s-t-r-e-t-c-h. Get started with theseflexibility exercises from the American Heart Association. Available Resources and Perks for Increasing your Physical Activity! This is a $70 value! We have 25 1-month memberships available to Lemon Grove School District Staff. Contactolopez@lemongrovesd.net to claim your free 1-month membership. Note - first come first served. We have 40 1-month memberships available to Lemon Grove School District Staff. Contactolopez@lemongrovesd.net to claim your free 1-month membership. 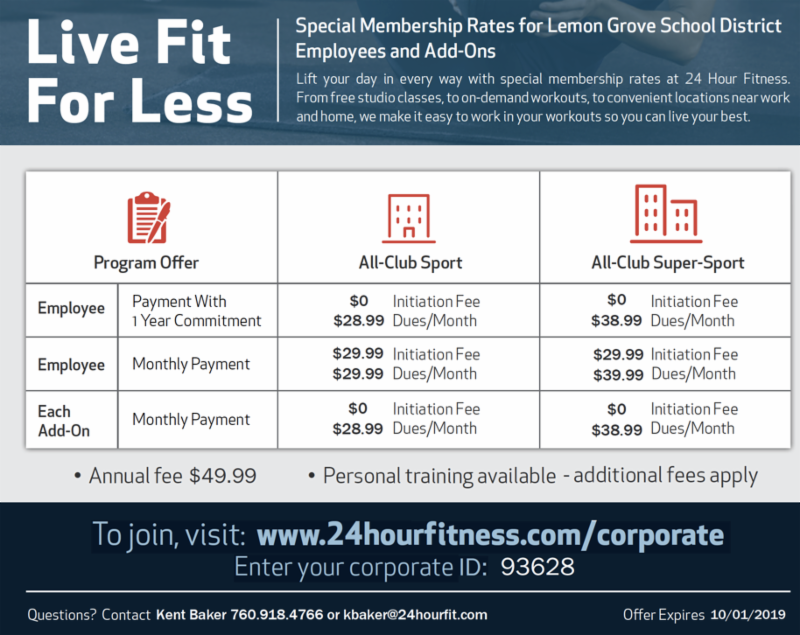 Sign-up for a discounted membership with 24-Hour Fitness in Lemon Grove. Note - Open to all employees of LGSD. Free ZUMBA Classes - open to everyone in the community! Monday, Tuesday, and Wednesday nights at 6:00pm, at the San Altos Auditorium. Come ready to dance! Free Bootcamp - open to all community members every Saturday morning!